Plant-based ingredients. Made in our clean, green factories. 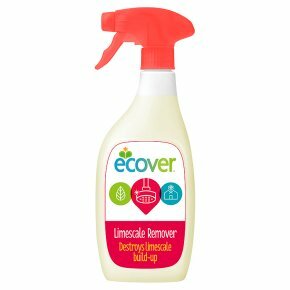 Destroys limescale build-up. UNEP award. Cruelty-free international.This hard-working spray sticks to surfaces to get rid of hard water build-up such as limescale and calcium deposits on sinks, taps, tiles & showerheads. Usage: For Showerscreens and Wall Tiles: Spray directly onto surface, leave to work for a few minutes depending on limescale build-up then rinse off with water. For Sinks, Taps, Tiles and Showerheads: Spray directly onto area, leave to work for a few minutes depending on build-up, wipe with a damp sponge then rinse. CAUTION: do not use on enamel, marble and natural stones, brassware, gold, silver, household appliances, damaged or hot surfaces.<br><br>WARNING.<br>CAUSES SERIOUS EYE IRRITATION.<br><br>ECOVER LIMESCALE REMOVER<br>Keep out of reach of children. IF IN EYES: Rinse cautiously with water for several minutes. Remove contact lenses, if present and easy to do. Continue rinsing. If medical advice is needed, have product container or label at hand.